SPS require high and consistent water quality. 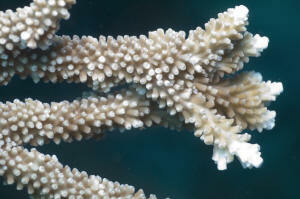 An unidentified Acropora species in S. Sulawesi. I was wondering if you had any experience with this brand/model? <I have not but I have never heard any negative feedback about Deltec Skimmers. It's best to post this question on one or more of the saltwater forums. May I ask if it is possible to change the AB pump inside Deltec MCE600 skimmer to Tunze Hydroformer silence to increase performance? Would a model Eheim 1260 with needle wheel impeller "external-ize" the skimmer? Are there any mods available for MCE600 to improve performance? I have rattling and loud humming sound with my MCE600 pump. I have tried to acid bath it for 48 hours, cleaned it, had it checked by the store where I bought from. From what they said, grommet, impeller and shaft all looks fine. Hence, I was thinking, instead of paying a lot of money to totally replace the pump, I might as well get a pump with higher airflow volume. I could just place it inside the skimmer without connect it to inlet and using a feeder pump to pump water into the inlet, effectively converting it into an external recirculating skimmer, or I could just use an external skimmer pump to pump into the inlet direct. I am also looking into getting a low iron, rimless 60X30X36cm tank. I am undecided as to get the 60p from ADA or a tank with same dimensions from ANS. May I ask would 60X30X36cm or 36X22X26cm be a better choice? May I also ask if Teco TR20 or Arctica DBA-250 be too large for a 2ft tank? I am living in the equator. Would Teco or Arctica be a better choice in terms of reliability, efficiency and noise level? Sorry for the numerous questions. Would ADA or ANS be a better brand for low iron, rimless tank? The unit of measure is correct. May I ask what would happen if I get chiller that is way overrated for my tank? <You would likely have temperature fluctuations. Would be cooling that small amount of water faster than the system could react. A minimum flow through the chiller is required and even with Artica's smallest unit (1/10th HP), a minimum flow of 240gph is required and that is a lot of water flow for a 5 or 10 gallon tank. For your application consider the product in the link below but it requires the tank or a filter box to be drilled to accept it and one may not be enough depending on the ambient room temperature of your home. One unit will drop the temperature 6 to 8 degrees F below ambient room temperature. See here. Thank you so much for helping with my previous questions, and now I have another for you if you don't mind. I'm in the process of choosing a skimmer for my 30 Gallon FOWLR. It's pretty much between the Deltec MCE300 or MCE600, if you're familiar with those models. I've heard a lot of good things about the 600 and some bad about the 300 but I am concerned about over skimming. Do you think that would happen with the 600? I may change the FOWLR to a reef tank in the future. Do you think the 300 would be fine for my tank? I have read some of the FAQs on the site re. skimming and Deltec (consensus seem they are good quality) and notice some people prefer overskimming to underskimming. I know its subjective and is down to personal experience but wanted a more informed opinion! ps. I recently asked a question re a aluminum stand and well...decided to bite the bullet and get a wooden one!